The Terasic Spider is a six-legged walking robot which is driven with 18 servo motors. These 18 servo motors are controlled by PWM signals generated from the Altera DE0-Nano-SoC board embedded inside the Terasic Spider. 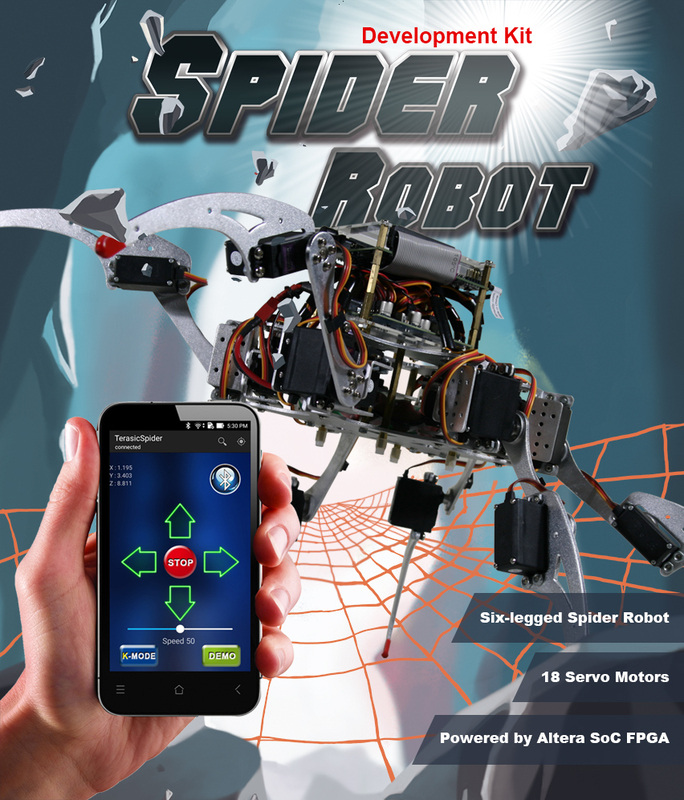 The Terasic Spider itself can be remotely controlled by a bluetooth enabled Android device. The software app that we developed can control the Terasic Spider to move in four directions, swing based on the g-sensor data, and even complete a dance with pre-defined movements. All the source codes of the Terasic Spider is available with the kit. You can modify the code to improve or to change the Terasic Spider's functions according to specific applications. The source codes include Android project, Linux application project, and a Quartus project. Note that there is a 2x20 GPIO expansion header available on the DE0-Nano-SoC board. You are free to use it to expand functions, such as camera, ultrasonic, or anything else.